Welcome to the website of K9-DoghealtH.com! One of the most frequent reasons of cancer is the incorrect functioning of the immune system. In the body of the adult dogs approximately 100 million cells are multiplied each day but some of them are bearing genetic defaults. One of the main functions of the immune system is to recognise and eliminate those defectives cells before they can reproduce and cause harm. However, if the malfunctioning immune system does not recognise the degenerated cell and the immune reaction falls off, the cell starts to increase and gives away the default. A tumour is growing. The basic goal of all immune modulating therapies to activate the immune system and through that to trigger the self-healing capacity of the body. The correctly functioning immune system recognises the tumour cells and eliminates them before they can reproduce. 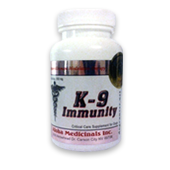 The active substances of the healing fungi contained by the K9 products (Beta-glucan, Lentinan, PSK, PSP) contribute naturally to strengthening the immune system thus assisting the body in vanquish the tumour cells and other pathogens bearing serious risks. 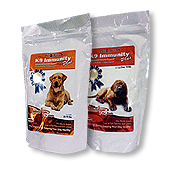 K-9 Immunity™ strengthens and balances your dog’s immune system so the body recognizes and destroys damaged cells. 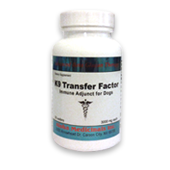 This improves their body’s ability to overcome illness and helps protect them against future illness. 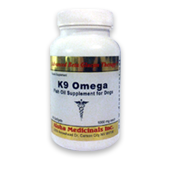 K9 Omega™ is a high quality fish oil supplement formulated specifically for dogs. It contains a highly concentrated blend of omega 3 fatty acids, it is guarantee free of the heavy metals and other debris commonly found in fish oil supplements. 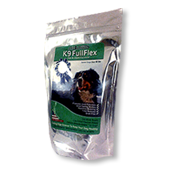 K9 FullFlex™ is a scientifically advanced daily supplement designed to decrease painful inflammation, improve mobility and increase joint strength.